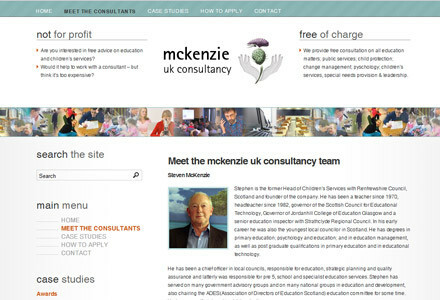 The McKenzie UK Consultancy site is another prime example of a situation where WordPress can be used to deliver a really high quality end result on a slim budget. The consultancy are not just a not-for-profit organisation – they are in effect a ‘not-for-turnover’ organisation. They don’t charge for their service, so value for money was crucial here. A poor online brand image would undermine the quality of the service they provide though, so it was important to properly reflect their high standards. I think we did pretty well. A couple of days work produced a nice clean looking WordPress site that’s well optimised, and contains some well laid out and readable content that communicates their core values and service offerings.